FACT CHECK: Is This a Photograph of a Dead Fairy? Is This a Photograph of a Dead Fairy? A photograph purportedly shows the remains of an 8-inch, mummified fairy found in Derbyshire. Maybe not anymore but a recent discovery would suggest that they probably did. 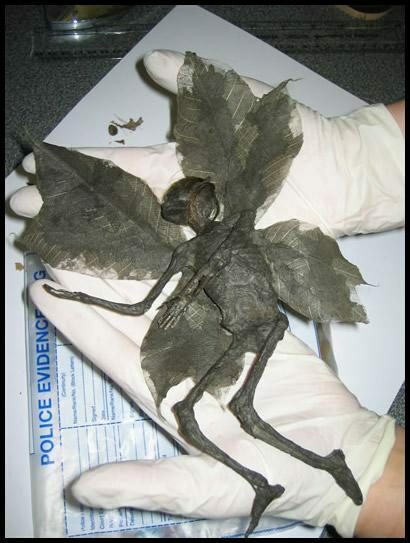 What appear to be the mummified remains of a fairy have been discovered in the Derbyshire countryside. The 8 inch remains complete with wings, skin, teeth and flowing red hair have been examined by archaeologists and forensic experts who can confirm that the body is genuine. X-rays of the fairy reveal an anatomically identical skeleton to that of a child. The bones, however, are hollow like those of a bird making them particularly light. The puzzling presence of a navel even suggests that the beings reproduce the same as humans despite the absence of reproductive organs. Thank you for the interest you have shown in my story. Even if you believe in fairies, as I personally do, there will always have been an element of doubt in your mind that would suggest the remains are a hoax. However, the magic created by the possibility of the fairy being real is something you will remember for the rest of your life. Alas the fairy is fake but my interest and belief has allowed me to create a work of art that is convincing and magical. I was also interested to see if fairy folklore is still a valid belief in modern society and I am pleased to say that yes it is! I have had more response from believers than I ever thought possible. As well as an artist I am also a magician and you have been my fantastic audience. That spark of magic ignited your imagination and made your day more memorable and exciting. I believe fairies to be Earth spirits rather than physical beings so my performance was slightly flawed. The question stills begs to answered though, are they made of flesh and blood like you and I? I hope you have not been offended by the events of the past few days but if you are I sincerely apologise. It took 50 years for the Cottingley fairies to be revealed as a hoax; at least you’ve only had to endure a few days of mystery. Photographs of a mummified fairy supposedly found in Derbyshire have been revealed as an April Fool’s prank. Former Derbyshire resident Dan Baines, 31, who designs illusions for magicians, made the fairy as a prank. The site got 20,000 hits in one day from fairy believers. “Although I’ve said it’s a hoax, people still believe that it’s real,” said Mr Baines. He added that it had taken him four hours a day to answer all of his emails. “I’ve had all sorts of comments including people who say they’ve seen exactly the same things and one person who told me to return the remains to the grave site as soon as possible or face the consequences,” he said. The fairy is about eight inches long with details such as a navel, ears and hair added for authenticity. Mr Baines added that he had now become addicted to April Fool’s jokes and told people to “watch this space” for future pranks. Dan Baines later put his fairy figure up for auction on eBay, where it fetched a high bid of £280.00.